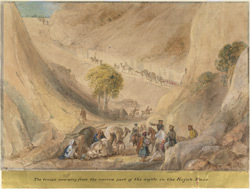 This drawing was made during the first Anglo-Afghan war of 1839-42, when Atkinson served as the official Superintending Surgeon of the Army of the Indus, a combined force of British and Indian troops that marched on Kabul in 1839. On route to Afghanistan British troops crossed the Khojak Pass which is five miles long and 7,575 feet tall at its highest point. Atkinson wrote: "At the foot of the hills on each side leading up to the Pass are regular rows of trees, giving an idea that in former times some care had been bestowed in embellishing the ground. At Parush appeared stupendous masses of perpendicular rocks, but affording two narrow paths, although only a few yards wide, that to the left was the usual Kafila route, while that on the right, although rarely trodden, had been cleared and made practicable by the Engineers for the passage of British troops and artillery."